Mangaluru, Dec 09, 2015: Senior Congress worker Harikrishna Bantwal has filed his nomination for the upcoming MLC elections, as an independent candidate on December 9, Wednesday. It has been gathered that Harikrishna Bantwal has gone against the advice of his mentor Janardhana Poojary to contest the elections. Speaking to media men later, he said he was contesting the election as a loyal Congress worker and also to ensure that the party leadership recognises good party workers. Stating that there was no question of withdrawing his nomination, he said " I neither have money nor muscle power but have the backing of large number of party workers." Regretting that sincere party workers had no opportunity in the party he said he was contesting so that the party does not do injustice to dedicated workers in the future elections. Speaking about his long association of over three decades with senior leader B Janardhana Poojary, Harikrishna Bantwal said he has stood by Poojary just because the nation needed leaders like Poojary. "We want to see a Congress which was built by great men like Gandhiji, Nehru and Indira and not a party of leaders like Oscar," Harikrishna Bantwal said. If elected, he promised to raise the Yettinahole issue in the Council and ensure that the project was dropped. 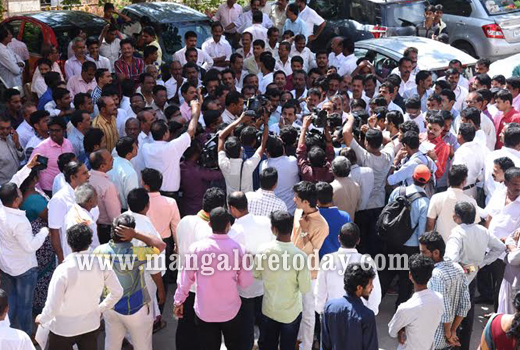 Several supporters of Harikrishna Bantwal including Arun Coelho, Kallige Taranath Shetty and others were present.